These days, people are a lot more conscious about what they put into their bodies. From avoiding fat, carbs, and gluten to eating a raw, vegan, vegetarian, or paleo diet, we’re all a little more aware about what we’re eating and how it might affect us. In an effort to combat sugar’s bad reputation and encourage you to buy their products, a lot of brands now use the label, ‘No added sugar’. Although this may sound like a healthy option, it might not always be what it seems, as we will explore below. When a product is labelled, ‘No added sugar’ it doesn’t necessarily mean that the item is sugar free. All the label actually denotes is that no extra sugar has been added in order to sweeten or preserve the food or drink. However, some products naturally have high levels of sugar to begin with. For example, a lot of fruit juices naturally contain very high levels of sugar. Even if no sugar is added to these fruit juices, you’ll still be consuming high levels of fructose whenever you drink a glass of orange, grape or apple juice. If you’re trying to reduce your calorie intake, drinking these ‘healthy’ alternatives can put a severe dent in your diet plan. To help control your calorie intake, and keep track of how much sugar you’re consuming, make sure you read the label. Even if a product is labelled ‘No added sugar’ read the list of nutrients and come to your own conclusions about whether or not the product really is a healthy option. Very few food and drink items are naturally free of all sugars. Most fruits and vegetables contain at least some sugar and virtually all processed food will have sugar added at some point before hitting the supermarket shelves. If a product is labelled ‘sugar-free’, it probably means that it’s been specially processed. 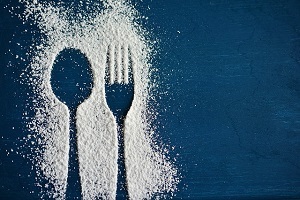 Some items that are produced for the diet market replace sugar with alternative compounds like aspartame. Many people believe that aspartame and other sweeteners are also damaging to health, so it might be best to avoid these artificial products as well. If you want to control your calorie intake and ensure you’re following a healthy diet, water is by far the best option when it comes to quenching your thirst. Naturally free of sugar, and containing no artificial sweeteners, or other harmful chemicals, water will keep you feeling healthy and hydrated. Find out more about improving the quality of water in your home by exploring our site today.